My friend lovinchelle posted a photo that has just grabbed me and won’t let go. Since I’ve been trying to use words more sparingly in my efforts at poetry, this seemed like the perfect opportunity to attempt Haiku. Just one Haiku. Seventeen syllables. That was the plan. I visited bussokuseki yesterday, and Gassho has written another of his beautiful Haikus, which seemed to affirm my decision to write one myself. To my surprise, he also lamented notebook pages covered with ideas that would not manifest themselves in cohesive writing. I searched for words to encourage him, but all I could think of was “Sometimes you’re the windshield, sometimes you’re the bug.” Needless to say I left without commenting. The inability to think of anything remotely intelligent to say should have been my cue to close the lid on my laptop, but sadly I did not. The photo embraced me like a pixellated python, my muse was on me like white on rice and I was damn skippy gonna write me a Haiku. But then I found myself unable to stop. Words tumbled onto the page like Gremlins fed after midnight. I was up until 3:00 a.m. I’m too old for this crap. I finally published what, in the wee hours of the morning, seemed like reasonably decent work. When I viewed the post this morning, I literally cringed. I don’t hate everything about it, but it does not do justice to the photo or the vision I was trying to convey. Thank you to those who “Liked” and commented, but it’s got to come down. If this were a meal I had spent all day on that turned into such a congealed mess, I’d fling that sucker into the trash and microwave a corn dog. But that picture won’t…let…go. So despite the heat I’m heading back into the kitchen. Instead of cramming it all together, I’m going to prepare it one course at a time. It should be presented with finesse, not haste. 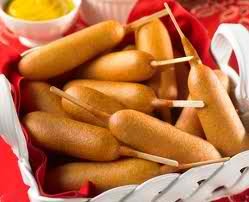 I adore corn dogs, but guests deserve better. The better to choke my arteries shut, no doubt 😉 I pulled that picture off Tumblr, and I like it because it’s just the slightest bit off center. It makes straight lines around it look crooked. Dontcha hate it when ego gets in the way? That feeling put me in a three year writer’s block- and I still have a lot of problems finding my own voice outside of flarf and aleatoric methods. Honestly- I’d like to hear/read the haiku- I bet it’s better than your self-critical introject will let you feel it is. Thank you- you’ve made my night yet again- and that’s saying something! I can’t wait to see the rest of the series. You inspire me.